Bill Jensen’s mission is to make it easier for people to get stuff done. Harvard Business Review, CNBC and Fast Company have called Bill today’s foremost expert on work complexity, helping people to do less and accomplish more. He’s an internationally acclaimed bestselling author and speaker who is known for extremely useful content, and his passion for working smarter, not harder. In 1992 Bill launched an ongoing study, The Search for a Simpler Way, and has interviewed and surveyed more than 500,000 people around the world about what really matters and how they get everything done. The research has supported all of his books. Bill is the president and CEO of the Jensen Group, a change consulting firm he founded in 1985. 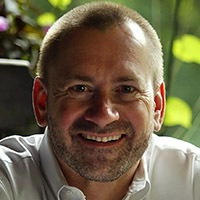 He lives in Morristown, NJ and travels the world as an inspiring speaker and practical workshop instructor.